Voted Plant of the Century by the public at the 2013 Chelsea Flower Show. 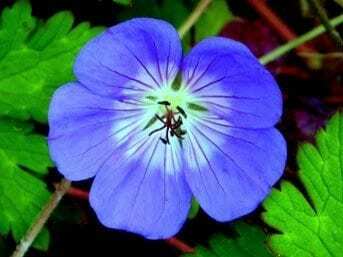 This lovely geranium has blue flowers with a white eye, which are held held above marbled leaves. Geranium Rozanne has a very long flowering season and finishes with excellent autumn colour to the leaves. It makes excellent ground cover in sun or light shade and will weave its way through shrubs. Pest and disease resistant. AGM status (Award of Garden Merit) at the 2006 RHS Hardy Geranium Trial. One of our best sellers, great in the border or over banks or walls. We have even used it in tubs and baskets! Pot size 9cm or 1.5 litre. Deciduous and disappears completely in winter, so it is worth mulching in late autumn if you live in an area with wet winters. Most plants are micropropagated these days, but it is possible to take stem cuttings for your own use.